How do you sleep in an exceedingly noisy environment? How do you beat jet lag? These are some of the questions we've had for years. This episode shows you how we've stumbled on a few nifty tricks to make travel so much better. And though I've learned over the years to make complex Indian dishes like biryani, peeling a humble hard-boiled egg seemed to be beyond my control. So here's what I did. I tapped the egg dozens of times so that it looked pretty much like a parched field. Six eggs probably had six hundred fragments with that insane tapping of mine, and it took me about half an hour to peel six eggs. Then I went on YouTube and found that all you had to do was tap the egg once on the kitchen bench and roll it forward and the entire peel would unfold in a matter of seconds. That's tip. A nifty tip. And since we travel so much every year, we've picked up some of these goodies along the way. Let's take on four of them. Some of them we've been using for years, and some we picked up just on this vacation to Sri Lanka and India. Here are the four, all in a row. 4: Why travel agents are invaluable (even though you can book everything on the Internet). In 2010, we conducted a series of workshops based on The Brain Audit. It seemed simple enough. The first three- day workshop was in California, the second just outside Washington D.C and the third in Vancouver. There was just one problem. All three workshops were in a span of approximately two weeks. This meant that we had to fly economy (we fly exclusively business now, but back then we flew economy) from Auckland to California. That's a distance 10,492 km and 12 hours. We conducted our first three day workshop in Campbell, California and then flew to Washington D.C.
You see the problem unfolding, right? The time difference between Auckland and California can be between 3-5 hours. You land in a different time zone, have little or no time to get used to the difference and you're off to Washington D.C, which is three hours ahead. And Vancouver? Yes, Vancouver is three hours behind. All of this meant that we were zipping back and forth between time zones, and bear in mind we had 3 workshops to conduct and no time to get used to jet lag. It's called No-Jet-Lag. They're tiny little pills you take every two hours on the flight. So if our flight was 12 hours long, we had to take 6 of those pills for the journey. There's just one problem: homeopathy isn't supposed to work. The dosage is so tiny in any homeopathic prescription that most doctors will tell you that it's a sham. Do we care? Of course not, because for years we've been having these pills on flights, stepping out on the other side and getting right into the time zone. Sweden is the “polar opposite” of time zones for us, because there's about a 12 hour difference. We flew from New Zealand to Copenhagen, Copenhagen to Stockholm and the entire trip, if I recall, was 39 hours door to door. The day after we landed, I was to give an hour-long presentation at around 3 pm. If you do your calculations correctly, that's 3 am New Zealand time (plus you do have to wake up, shower and go through some practice runs). All we know is that we travel a lot every year, crisscrossing the globe for work, but mostly on vacation. International travel is tiring and No Jet Lag won't help you with the tiredness. It's like being in a car. If you travel 12 hours, it feels like 12 hours. However, you don't feel like you've changed so many time zones. For me, especially, this is important, because more often than not, a Psychotactics workshop will be three days long. It's one thing to get on stage and give an hour long speech, but quite another to be on your feet (and awake) for three whole days. One ex-air hostess said she doesn't eat or drink anything on the flight. Sorry miss, but we love our champagne and the food helps us pass the time on these very long trips out of New Zealand. We've used No Jet Lag since 2004, and it's worked just fine for us, so we'll stick to our weird little formula. No, it's not to do with the ingredients. Instead it's more to do with keeping to a plan. Before I leave, I set alarms on my phone to go off every two hours until we reach our destination. That way I can be sure we don't miss the two-hour cycle. Apparently, you can take it every four hours if you're asleep, but not many of us sleep for hours on a flight, hence the alarms keep us on track. The instances where these tablets haven't worked is when we've been sloppy and popped them whenever we feel like it. Like this trip, returning back from India. We didn't keep to an alarm plan and we were waking up at 3 am for about a week. Do your due diligence and you're likely to still be exhausted, but at least nicely ensconced in the new time zone. No Jet Lag is made in New Zealand, so pretty much every medical store and travel store has it on display. If you go to their website at http://www.nojetlag.com/where-to-buy-No-Jet-Lag.html, you can find out where it's available. Try it. And that's it. Our first nifty travel tip. The second one is pretty cool, though because noise is just part of travel. How do you sleep soundly in extremely noisy environments (without earplugs)? Get ready for a story that you're just not expecting. Let's assemble some speakers, shall we? Let's take a speaker, the size of your desk. Then let's add another speaker on top. Then just for good measure, let's add two more huge speakers on the other side and turn them on at full blast. Do you think you'd be able to sleep through the night? However, nothing was quite as nice as Apa Villa. A huge mansion-like villa, it seemed to be surrounded by forest. Almost without fail, as you were seated for breakfast, you'd have wildlife of all sorts not more than 50 metres away. Monkeys, peacocks, monitor lizards and the occasional mongoose, they all were part of this jungle scenario. And in the middle of it was Apa Villa, in all its luxury—but mostly, quiet. Quiet that we luxuriated in. The place had been rented out for a big, noisy party that would start at 9 pm and go on until 7:30 am. And those speakers, that wall of speakers, was aimed right towards our room. And where there's a party, there are people drinking, talking and getting louder every minute. Except for the fact that we mostly slept through most of the noise. The moment this concept is brought up, most people nod and smile. They know what white noise is all about. It's a sound created by say, the hum of an air conditioner. Or the sound of the sea. However, most people don't think of battling noise with more noise. Instead, what they tend to do is try and reach for earplugs. Which, if you're someone like me, is a pointless exercise. Not only am I a light sleeper, but I damaged my right ear, using cotton buds when I was younger. I can't sleep with anything in my ear as it just hurts. We turned it on loud, to the sound of rain. At first, it might seem too loud for your ears, but your brain soon adjusts to it. And in doing so it tunes out the rest of the noise almost completely. Think of it as being at a party. Someone across the room mentions your name and your attention is instantly focused on that person, instead of paying attention to the discussion right in front of you. White noise—and yes, there's an app for it—does exactly that function. It helps your brain focus on the rain—or whatever sound you prefer, and tunes out the rest. We slept through the noisy clatter of feet in Leiden, in the Netherlands. We even slept with a jackhammer going outside our hotel window in Goa, India. And the more you travel, the more you realise how much you crave silence on your vacation. Well, there you have it. Battle noise with white noise and you'll have a restful sleep. In fact, don't just use it on vacation. You can even use it at home when your neighbour has decided to create his own wall of speakers to party through the night. Many people go on vacation from Point A to Point B. If that's the case, you don't need much help, do you? However, if your travel plans are a bit like ours, you're going to need a bit of help. And incredibly, that help is free in an app called TripIt. The app works like a really efficient secretary. As you book hotels, cars, and other elements on your vacation, you tend to get an e-mail with the confirmation. The moment you forward it, it will collate all the information from that e-mail and order it sequentially in the app. This means if you're headed to Auckland on Thursday, via Air New Zealand, then staying at an Airbnb, and picking up a car at 2 pm, the app will slot all of these activities in chronological sequence. All the details, booking numbers, directions—anything contained in the e-mail will all be put in neat little sections so that you can dig deeper into your reservations as well. As soon as you open the app, it nudges you with a paid link. You are likely to ignore the paid link, but it's enough of a red flag to get you book your accommodation for the night. If you choose to opt for their paid service (which isn't much at $45 or so, per year) you'll get a lot more features that all help the frequent traveller. If you're not a frequent traveller and just a complicated traveller like me, then the free version works just as well. But what about your privacy? Obviously all of this information is sitting somewhere in a server. Someone could get all of this information and use it for nefarious purposes. They know where you're going, what you're doing, etc. Isn't that dangerous? Yes, it's dangerous, but if someone really wants to track where you're going; if they're really motivated, there are many ways to get that information. The moment you start booking things online; or rather the moment you went online fifteen or twenty years ago, your privacy was private no more. There's always the option of keeping all the information in a printed format with your passport, but if you're into digital apps, this is the way to go. That's nifty trip no.3. Shall we go onto 4? Isn't that a profession from the last century? That's what I thought until I ran into a travel agent at a party. We got talking and later when I got in touch with him, I realised that the Internet wasn't the friend I thought it was, after all. For years, Renuka and I have been booking our air tickets and hotels online. Imagine my surprise when I realised I'd been paying a lot more by going online. 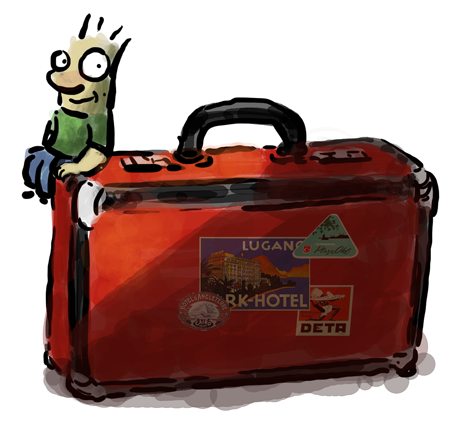 Granted, our trips can be extremely complex, but even so, I was shocked at how useful the travel agent happened to be. A single vacation can involve several hotels, connections etc. And if you're zigzagging, it's not easy to find connecting flights or even airlines that you prefer. These days, all I do is e-mail the travel agent, and a few hours later, with no work whatsoever, on my part, he shows up with all the flights I need. Just to make things easier, he knows we hate to catch early morning flights because it means you've got to wake up even earlier. Many of our flights take off around 11 am or noon, or even later, depending on where we're headed. In short, the travel agent's screen is entirely different from the one you have at home. Instead of burning through an entire evening trying to get the flights and hotels you want, an agent takes over all the hard work for you and gives you a quote. They know they can't randomly throw in high quotes. At first, we got some incredibly unintelligent agents, but in time we did run into one who understood our needs and was able to make the bookings quickly, effectively and at the prices that worked well for us. This agent also looks at my schedule and will make suggestions. For instance, he told us to avoid spending more than a couple of days in a city in Europe because the city was boring (it was). It's the little bits and pieces, the little suggestions that make a good travel agent worthwhile. Plus if you get stuck, things change, while the other passengers are lining up, a travel agent can quickly make changes for you. Walk into a travel agency today if you're planning a trip. You might be amazed at how much time and energy you save in the future. And at no extra cost either. And there we have it, our four nifty tips. 1: How to completely sidestep jet lag. You do it with No Jet Lag. Remember to set your alarms before you leave. 2: How to sleep soundly in extremely noisy environments (without ear plugs). Get a white noise app. Most of us would sleep soundly to the sound of falling rain. 3: TripIt is a travel app that sorts out your entire sequence (especially if you have a complex set of journeys). Every single part of your journey is mapped out in handy screen. No need to dig through a dozen e-mails. And you can often use the information on TripIt when checking in at airports. 4: Travel agents are invaluable (even though you can book everything on the Internet). You may never have considered a travel agent recently, but I am totally hooked. Our travel agent has saved us hours of needless searches, gotten us out of boring places, made bookings in places where everything is seemingly full and done it all without any extra charge. I don't know about you, but that's magical. That's pretty much it. Bon Voyage! Next Up: No one thinks running a small business is easy. But even so, there are forces that pull you in all directions. These forces almost seem to tear at us as we go through our daily work. Find out the answer here: How do you cope with the forces of small business?